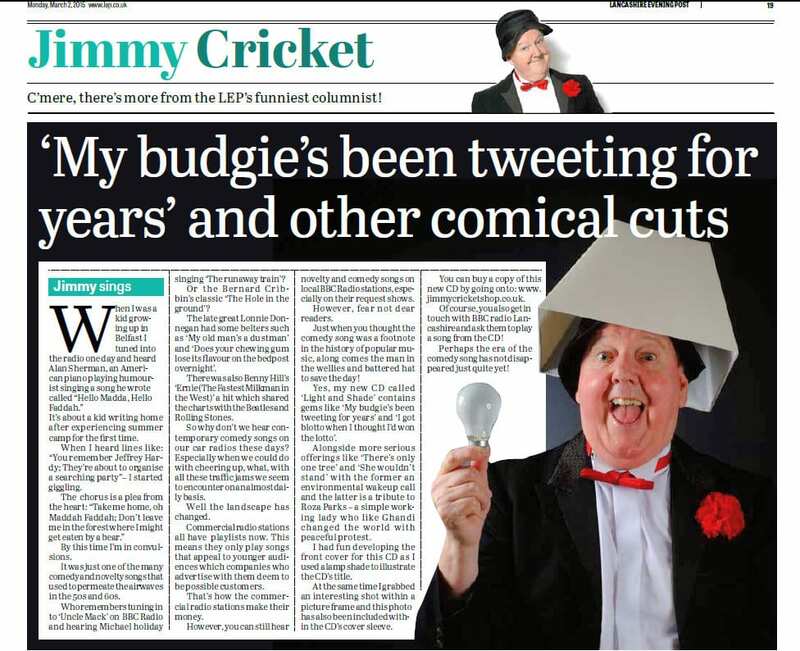 Jimmy Cricket has been reminiscing about the era of the comedy song and how he hopes he has helped keep it alive. 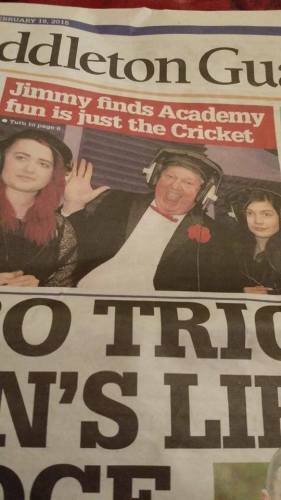 In his latest column for the Preston-based Lancashire Evening Post, the famous entertainer recalls “the many comedy and novelty songs that used to permeate the airwaves in the 50s and 60s”. He adds: “Commercial radio stations all have playlists now. This means they only play songs that appeal to younger audiences , which companies who advertise with them deem to be possible customers. That’s how the commercial radio stations make their money. “However, you can still hear comedy and novelty songs on BBC radio stations, especially on their request shows. “However, fear not dear readers. “Just when you thought the comedy song was a footnote in the history of popular music, along comes the man in the wellies and the battered hat to save the day! 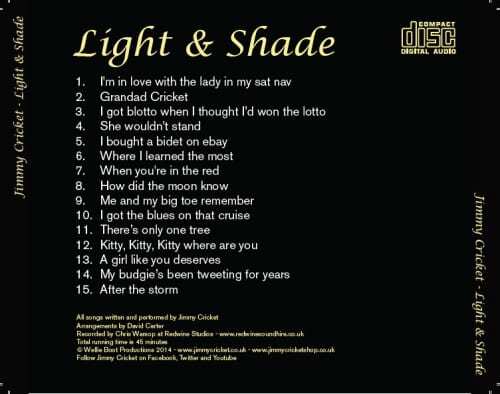 Light & Shade was officially released on 1 February and is available for £6 at www.jimmycricketshop.co.uk and at Jimmy’s live shows. In the inside sleeve, Jimmy talks about the history behind the CD, which features a mixture of serious and comedy songs. 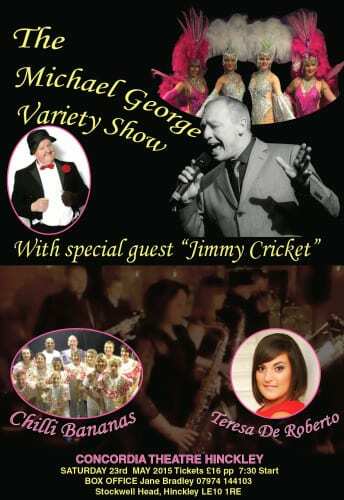 Jimmy Cricket has been asked to team up with Midlands crooner Michael George for two special shows in May. It will mean an evening of great swing music combined with Jimmy’s inimitable style of comedy. There will also be a live band and some great support acts lined up. One production will be at the Concordia Theatre in Hinckley, Leicestershire, near to where singer Michael George is based. In fact, it is becoming an annual tradition for him to bring a show to the Concordia Theatre as this is the third time he will do so. Each of the previous two shows have been very well attended, so everyone is expecting a packed auditorium when Jimmy joins Michael for this year’s version on Saturday 23 May. Virtually the same production will visit the Trinity Arts centre in Gainsborough a week before the Concordia one as both Michael and Jimmy head there on Saturday 16 May. Famous comedian Jimmy Cricket was a special performing guest at an 80th birthday party recently. 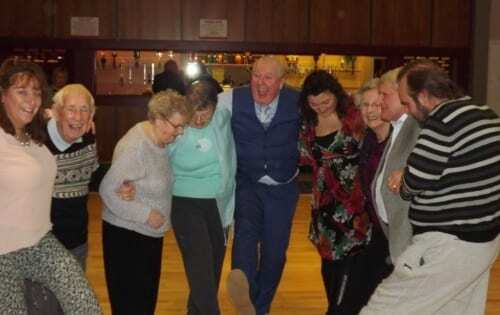 The event was held for Sheila Selby at Haydock conservative Club at the end of January. 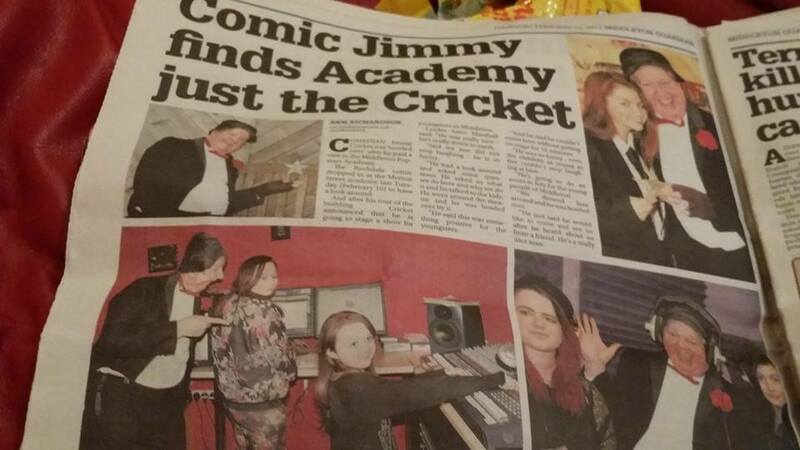 Jimmy, who provided the entertainment, said: “I was honoured to have participated in this special event. The photographs were taken by Fred Carter. Jimmy Cricket says he has tried to give people who buy his latest musical CD “a few surprises”. The inside sleeve has the following message from the famous entertainer, in which he talks about the history behind the CD, which features a mixture of serious and comedy songs. It’s me Jimmy, come closer! I was asked to write something for this sleeve, so I thought I would do something off the cuff. Get it! These are the songs I’ve written and performed at my little ‘Jimmy and friends’ nights which I’ve done at St Vincent’s parochial hall in Rochdale over the last few years. When I do shows I like to give the audience a few surprises and I’ve tried to do the same with this CD. Sure there’ll be comedy songs that you would associate with Jimmy Cricket, but I’ve also thrown a few serious ones in too! So whether you’re listening in the car, at home, or walking along with your earphones, I hope there is something there for you. I’d like to mention two people who‘ve been the bedrock of this CD. Firstly, musical arranger David Carter, whose god given talent enables him to breathe life into my tunes and words. And record producer Chris Warsop, who has worked tirelessly and painstakingly over the last six months in making sure we had a quality product at the end. To them I am eternally grateful, as indeed to you for buying it. Jimmy Cricket returned to action after his festive pantomime spell with a show in Milton Keynes. The well-known entertainer appeared at the Lovat Fields Retirement Village in Milton Keynes, which is part of a national chain run by the Extra Care organisation. Jimmy has appeared at some of their other sites over the years in St Helens, Warrington and Coventry. This particular visit was organised by Mary Cooper, who is one of the residents at Lovat Fields and is involved in helping to arrange the entertainment programme. A big thanks to Mary for also sending in the slideshow photos of the night. Jimmy said: “This was my first show after the Christmas pantomime season. * Click on either of the arrow buttons above to view the slideshow. 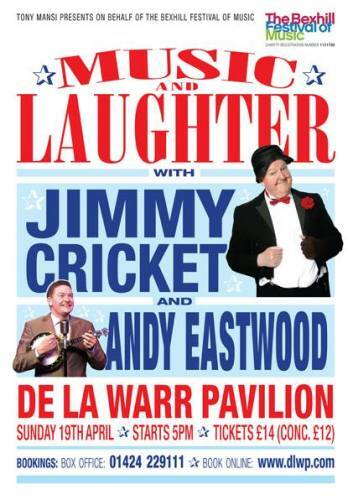 The first venue that famous comedian Jimmy Cricket will be visiting for his 2015 shows around the UK is the Plaza Theatre in Stockport on Sunday (25 January). With the show scheduled for a 3pm start, there is the chance to have Sunday lunch with all the family, then go along to see him and laugh away the calories! Tickets are priced at £10 (£5 for under 16s). Jimmy embarks on a tour of Northern Ireland with the You Must Be Joking show next week. 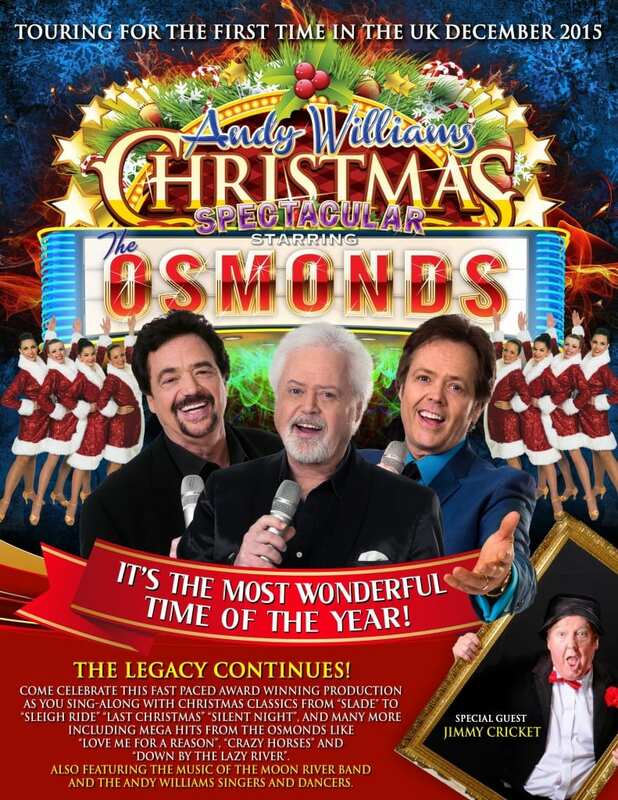 When the veteran entertainer visits the charming Lamproom Theatre in South Yorkshire during February, he will feature in a format that will afford the audience an opportunity to ask him a question, as he brings his Audience with show to the Barnsley region. Jimmy’s trip to the Victoria Theatre in Halifax on 25 March will be part of a Music Hall show that his good friend, Neil Hurst, is organising. And he is also looking forward to visiting Bexhill-on-Sea, where the team behind the Bexhill Festival of Music are organising the show he will headline in April. All the other venues on the list shown above right will also present Jimmy’s Value for a Tenner show. 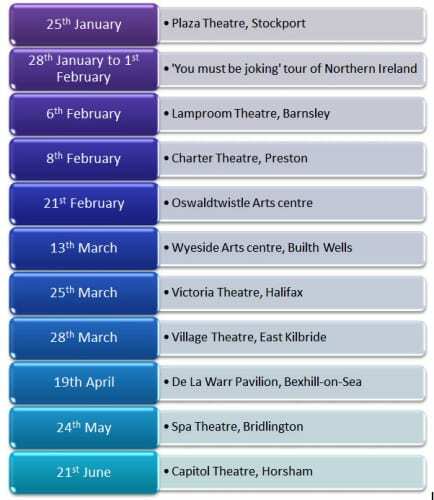 So if you live in one of the regions Jimmy will be visiting during the first half of 2015, do go along and see him in action.